The reviewer obtained a copy of this book from her public library. Can you imagine what it would be like to live your life as someone else? 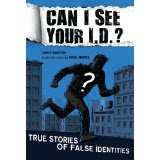 Chris Barton gives readers a chance to explore the answer to that question in Can I See Your I.D.? The book features the stories of ten real people who took on false identities. I found myself pulled into the book from the first chapter which details how a sixteen year-old boy successfully found a way to impersonate a subway motorman so that he could drive the A train in New York in 1993. "If you run, you'll be killed for sure. And so, hoping no one will notice amid the smoke and bombs and hum of German planes, you gouge a hole in the earth with the heel of your shoe. You drop those incriminating papers into the hole and sweep dirt on top of them. The Germans are sticklers for proper documentation, but now you have none. It's almost as if you have no identity at all." - From the chapter "Hitler Youth? Solomon Perel"
Another chapter describes how Ellen Craft, a female slave from Georgia, disguised herself as a white man in an attempt to escape to the North with her husband in 1848. Each chapter ends with a brief update entitled, "What Happened Next?" In the case of Ellen Craft, she successfully reached Philadelphia and later returned to Georgia to open a school for former slaves. Can I See Your I.D.? will appeal to YA readers for a number of reasons: the writing is accessible to a range of readers, and the ten subjects featured in the book are really interesting. Black and white, comic illustrations by Paul Hoppe are the perfect compliment to these intriguing stories. Readers will learn about history without slogging through a dense text book, and many of the stories could serve as a springboard for teens who want to explore the topics in more depth. For example, some readers may be inspired to read Black Like Me after learning about John Howard Griffith's social experiment posing as a black man in the deep south in 1959. It's evident that Barton spent a great deal of time researching the ten individuals featured in the book. A lengthy bibliography in the back of the book will direct teens to other books they may want to check out. Can I See Your I.D.? would make an excellent addition to any YA collection and should be put in the hands of reluctant readers immediately! Here's a video of Kathi Appelt interviewing Chris Barton about Can I See Your I.D. ?